Regardless of the size of your business, the most effective security measure to deploy to block threat actors from gaining access to your servers, workstations, and data is a hardware firewall. A hardware firewall will ensure your digital assets are well protected, but how should your firewall be configured for optimal network security? If you follow network segmentation best practices and set up firewall security zones you can improve security and keep your internal network isolated and protected from web-based attacks. Most businesses have a well-defined network structure that includes a secure internal network zone and an external untrusted network zone, often with intermediate security zones. Security zones are groups of servers and systems that have similar security requirements and consists of a Layer3 network subnet to which several hosts connect. The firewall offers protection by controlling traffic to and from those hosts and security zones, whether at the IP, port, or application level. There is no single configuration that will be suitable for all businesses and all networks, since each business will have its own requirements and necessary functionalities. However, there are some network segmentation best practices that should be adopted. 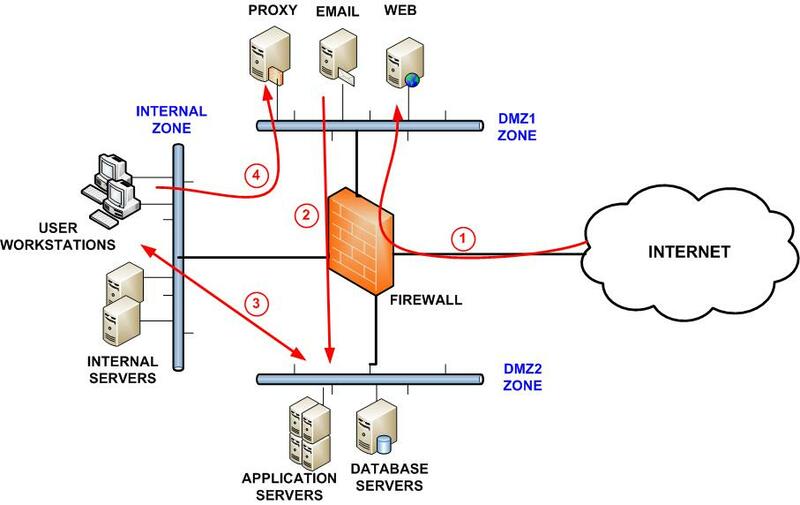 In the above illustration we have used firewall security zone segmentation to keep servers separated. In our example we have used a single firewall and two DMZ (demilitarized) zones and an internal zone. A DMZ zone is an isolated Layer3 subnet. The servers in these DMZ zones may need to be Internet facing in order to function. For example, web servers and email servers need to be Internet facing. Because they face the internet, these servers are the most vulnerable to attack so should be separated from servers that do not need direct Internet access. By keeping these servers in separate zones, you can minimize the damage if one of your Internet facing servers is compromised. In the diagram above, the allowed direction of traffic is indicated with the red arrows. As you can see, bidirectional traffic is permitted between the internal zone and DMZ2 which includes the application/database servers, but only one-way traffic is permitted between the internal zone and DMZ1, which is used for the proxy, email, and web servers. The proxy, email, and web servers have been placed in a separate DMZ to the application and database servers for maximum protection. Traffic from the Internet is allowed by the firewall to DMZ1. The firewall should only permit traffic via certain ports (80,443, 25 etc.). All other TCP/UDP ports should be closed. Traffic from the Internet to the servers in DMZ2 is not permitted, at least not directly. A web server may need to access a database server, and while it may seem a good idea to have both of these virtual servers running on the same machine, from a security perspective this should be avoided. Ideally, both should be separated and placed in different DMZs. The same applies to front end web servers and web application servers which should similarly be placed in different DMZs. Traffic between DMZ1 and DMZ2 will no doubt be necessary, but it should only be permitted on certain ports. DMZ2 can connect to the internal zone for certain special cases such as backups or authentication via active directory. The internal zone consists of workstations and internal servers, internal databases that do not need to be web facing, active directory servers, and internal applications. We suggest Internet access for users on the internal network to be directed through an HTTP proxy server located in DMZ 1. Note that the internal zone is isolated from the Internet. Direct traffic from the internet to the internal zone should not be permitted. The above configuration provides important protection to your internal networks. In the event that a server in DMZ1 is compromised, your internal network will remain protected since traffic between the internal zone and DMZ1 is only permitted in one direction. By adhering to network segmentation best practices and using the above firewall security zone segmentation you can optimize network security. For added security, we also recommend using a cloud-based web filtering solution such as WebTitan which filters the Internet and prevents end users from accessing websites known to host malware or those that contravene acceptable usage policies.